Docents are available for questions and tours on Thursday’s (except Holidays) from 1 to 3pm during January to April. 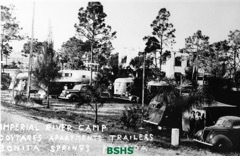 In August 2006 the Bonita Springs City Council granted permission to the Bonita Springs Historical Society to occupy space at the newly renovated Liles Hotel. History exhibits are now on display in the public areas of the hotel and a first floor room is decorated as a period bedroom representative of the 1930’s. The Society’s two rooms on the second floor are utilized as a history resource center, available for use by the public, with the goal of furthering the study and understanding of our local heritage. As a result of visiting the Liles Hotel we hope that visitors will come away with a greater appreciation of the past which helped to create the special place that is Bonita Springs; and in turn, see the value of encouraging preservation of our cultural and historical resources. In addition, the creation of these facilities will hopefully allow the City of Bonita Springs to join the ranks of other nearby cities offering historical museums to their citizens. It can only help to reinforce the value of our City’s own unique identity as we present a cohesive timeline of local history separate from the nearby cities such as Fort Myers and Naples. The public is invited to view the exhibits on both floors and the building is normally open for visitors: 9am to 4pm, Monday through Friday. The riverfront park setting, complete with water fountain, walking plaza, boat docks, and local artisans in the historic cottages provide a great family venue in the heart of Old Bonita. In addition to free educational handouts, such as the color booklet, Historical Properties of Bonita Springs - the new history book from Arcadia Press titled, "Images of America" Bonita Springs, is available for purchase at $22. 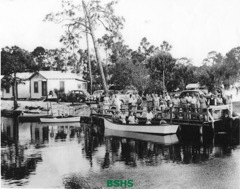 Authors Chris Wadsworth and Allison Fortuna have partnered in writing the pictorial history book of Bonita Springs. See the navigation menu at top for more information.